The Singapore Grand Prix became a firm favourite when it joined the calendar in 2008 as F1’s first night race. Just before the tenth edition, the organizers signed a new four-year contract that guarantees the event’s place on the F1 calendar until at least 2021. The 2019 race takes place on 19-22 September. 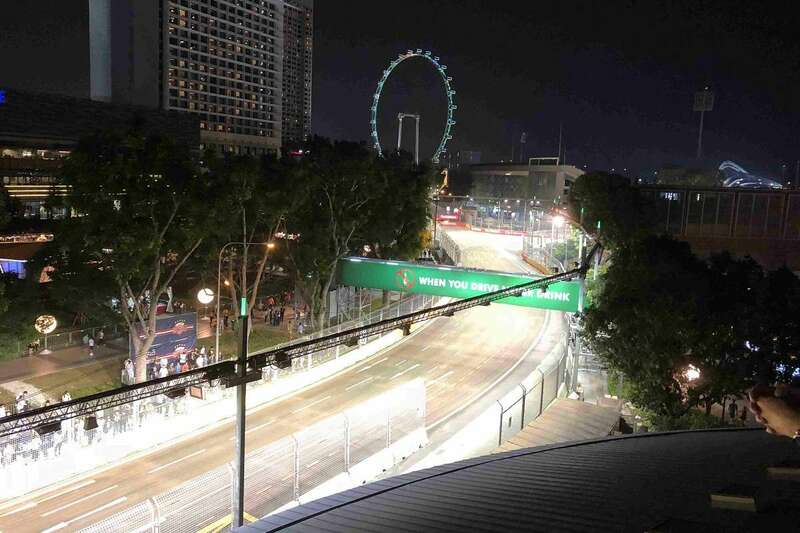 Formula 1’s first night race has firmly established itself as one of F1’s premier destinations thanks to its spectacular location on public roads set against a backdrop of the spectacular Singapore skyline, slick marketing and big name concerts. The event has enjoyed strong financial support from the local government, but the organizers are not rushing into the next contract with F1’s new owners, Liberty Media, as they presumably chase a better deal. The current contract ensures the event’s place on the calendar until at least 2021. Attendances at the Singapore GP have actually fallen in recent years (from 87,000 in 2015 to 73,000 in 2016) and the race in neighboring Malaysia fell off the calendar for 2018 due to big financial losses. Despite the falling attendances in recent years, the event is still a big tourist draw card, attracting over 30,000 international fans to the city state each September. 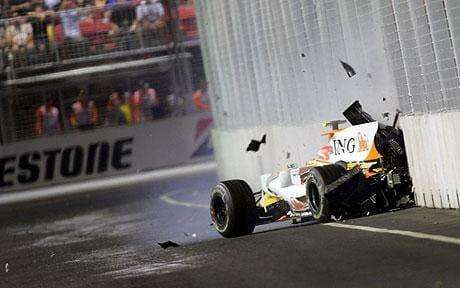 The inaugural race in 2008 is best remembered for Nelson Piquet Jr’s infamous ‘deliberate’ crash (see picture opposite) which helped his Renault teammate Fernando Alonso to a controversial victory. After being sacked by the team the following year, Piquet Jr claimed that he was following team orders. The results of the subsequent race-fixing investigation launched by the FIA saw Renault receive a suspended 2-year ban from the sport and two leading members of the team – Flavio Briatore and Pat Symonds – banned from involvement in F1 for a number of years. During the inaugural event in 2008, the track drew criticism from drivers who complained about the excessively bumpy surface, potentially dangerous pit entry, and high curbs. Whilst these issues were sorted out, it wasn’t until before the 2013 race that the FIA approved some larger changes to the configuration of the Marina Bay circuit. The “Singapore Sling” chicane at turn 10 was removed and replaced with a simpler, faster left-hand turn. Further minor changes to the layout of the track from turns 11 to 13 were made ahead of the race in 2015, mainly to improve overtaking opportunities. The current layout of the circuit is pictured opposite. 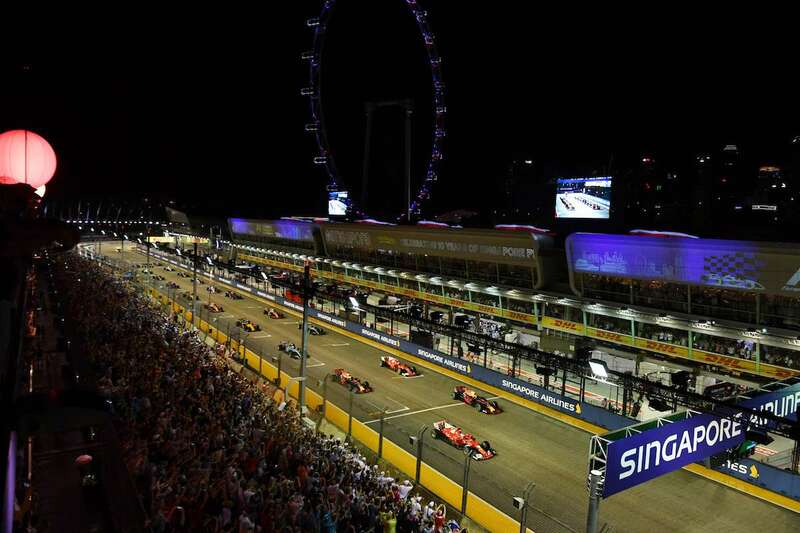 Singapore Grand Prix: Did You Know? Just four drivers have shared victories at the nine Singapore Grands Prix held since 2008. Sebastian Vettel (2011-2013, 2015) and Lewis Hamilton (2009, 2014, 2017) have won four times, Fernando Alonso twice (2008, 2010), and Nico Rosberg once (2016). The Safety Car has made at least one appearance in every Singapore Grand Prix held to date. With frequent Safety Car periods, it’s not unusual for the Singapore Grand Prix to run to the two hour limit. Four races here have been won in a time of over two hours. Spare a thought for the drivers, who endure sauna-like conditions in the cockpit during the Singapore Grand Prix and can lose up to 3kg of fluid during the race. The circuit, with its bumpy surface and 21 turns, is one of the most physically demanding races on the calendar. 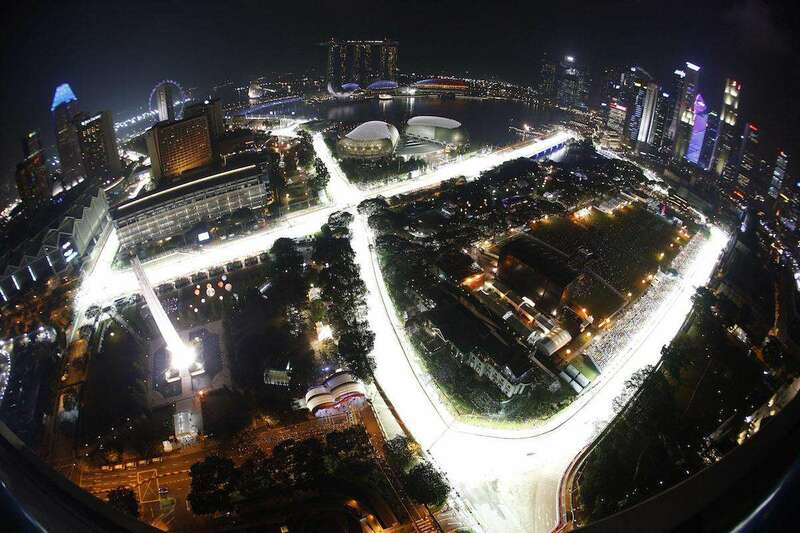 Approximately 1600 custom-made floodlights are spread around the 5.075km Marina Bay circuit. The lights, four times brighter than at a regular sports stadium, are specially designed to minimize glare and surface reflection, and to meet F1’s TV broadcasting standards. 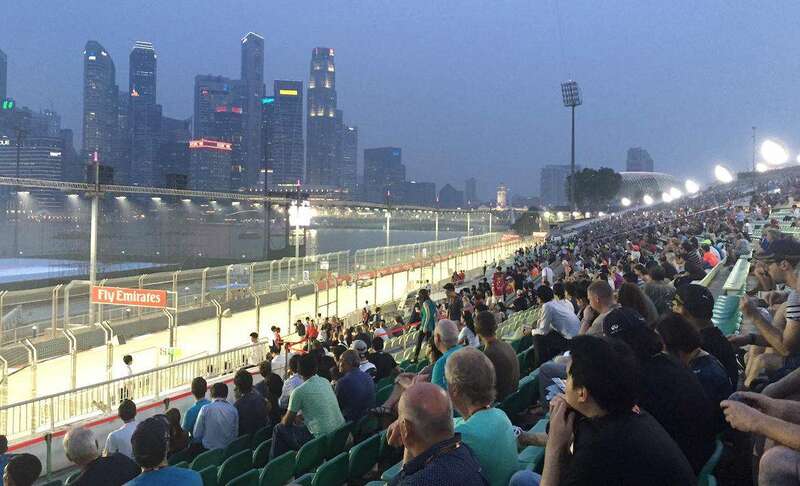 No driver is yet to have recorded more than 3 DNFs at the Marina Bay Circuit. Plenty of drivers have recorded 3 non-finishes here though, including reigning champion Lewis Hamilton. The 2017 Singapore Grand Prix was the first, and so far only, night race to be held in wet conditions. Red Bull have had more podium finishes here than any other team. They’ve scored top three results 12 times in total, double the tally of Ferrari and Mercedes. Since 2009, if the polesitter hasn’t won the Grand Prix, they have retired. The two DNFs for the polesitter at the Singapore Grand Prix came in 2012 (Lewis Hamilton) and 2017 (Sebastian Vettel). We’ve crunched the numbers on the cost of going to the 2019 Singapore Grand Prix and here’s the results! Food, shopping, nightlife and beaches. Your guide to the best activities away from the Marina Bay street circuit for the Singapore Grand Prix on September 19-22, 2019. Start planning your trip to the Singapore Grand Prix. The next Singapore Grand Prix is on on September 19-22, 2019. Buzzing hostels within walking distance of the circuit, luxury hotels in the heart of the action, rooms with a view. Singapore has it all when it comes to places to stay for the Singapore Grand Prix. Your guide to buying tickets for the 2019 Singapore Grand Prix on September 20-22, including the best grandstands. Your guide to getting the most out of your trackside experience at the Marina Bay Street Circuit for the Singapore Formula 1 Grand Prix. The best ways to get to Singapore for the Singapore Formula 1 Grand Prix, plus how to get to the Marina Bay Street Circuit and around the city. I am planning to buy the duan lipa and martin Garrix ticket for this yrs event, I was wondering if the concert tickets give me access to watch the actually F1 RACE? No it is the other way around. You need race tickets in order to watch the concerts. You cannot just buy concert tickets.